Call it noir, or just call it what it is: Black and white at night. For this week's Shooting Challenge, ditch the cheesy detective hats, but keep the beautiful juxtaposition of whites, blacks, and the gradient grey in between. Take a black and white photo at night. Night is an amazing time to take photographs. A dark space with a few light sources creates a naturally high contrast image—which tingles the eyes like a coat of salt on the tongue. And even though our cameras can all shoot color, black and white forces the viewer to focus solely on light and shadow. For the shoot itself, check out this tutorial that will remind you of some of the basics. For the post-production, here's a list of methodologies to convert color to black and white—good for those of you looking to milk the most out of each pixel. Our lead shot is by flickr's eioua. Would this image work in color? Maybe. 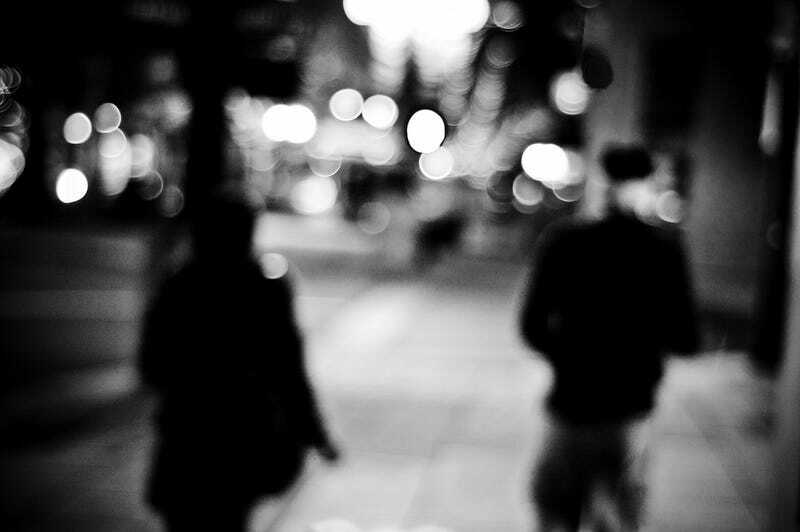 But the black and white elevates the figures and the bokeh into something more mysterious or fleeting, and the dark subjects juxtapose the bright light in an intriguing, binary way. Send your best photo by Monday, March 18th at 10AM Eastern to contests@gizmodo.com with "Night" in the subject line. Save your files as JPGs, and use a FirstnameLastnameNight.jpg (970px wide) and FirstnameLastnameNightWallpaper.jpg (2560px wide) naming conventions. Include your shooting summary (camera, lens, ISO, etc) in the body of the email along with a story of the shot in a few sentences. And don't skip this story part because it's often the most enjoyable part for us all beyond the shot itself!